2017 World Pumpkin Weigh-off winner! Some of the area’s – if not the world’s – largest pumpkins will be featured at the Great Pumpkin Farm in Clarence this weekend, as the annual World Pumpkin Weigh-off takes place Sunday, Sept. 30, beginning at noon as part of the Fall Festival’s third weekend of fall fun! 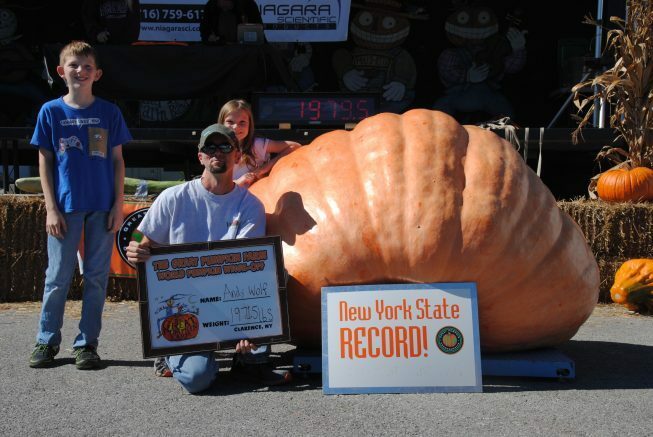 Last year, Andy Wolf of Little Valley took first place (and set a New York State record) with his 1,971.5-pound pumpkin, upsetting the previous two-time champion, Karl Haist of Clarence. Can that number be topped this year? Will one of the entries be large enough to set a world record – and take home a $10,000 cash prize? The Great Pumpkin Farm had the first 1,000-pound pumpkin at the 1996 Great Pumpkin Farm Fall Festival – 1,061 pounds – and it went right into the Guinness Book of World Records. Since then, there have been many pumpkins entered in the Weigh-off well over that weight. What will this year bring? Winners will be announced Sunday as soon as all entries are officially weighed in. The owner of the largest pumpkin at the World Pumpkin Weigh-off will take home the top prize of $5,000 (with the chance to win twice that amount and earn a world record if his or her pumpkin weighs over 2,000 pounds). Cash prizes will also be awarded for second through sixth place. For more information, including rules and a list of previous years’ winning entries, visit https://www.greatpumpkinfarm.com/event/2017-world-pumpkin-weigh-off/. Be the first to comment on "It’s the annual World Pumpkin Weigh-off at the Great Pumpkin Farm this weekend"